2.4. Who can authenticate with SAML? This SAML HowTo can serve as a good example of how Unity works in general. That said, reading it will help when integrating other protocols (as an external LDAP authentication) too. 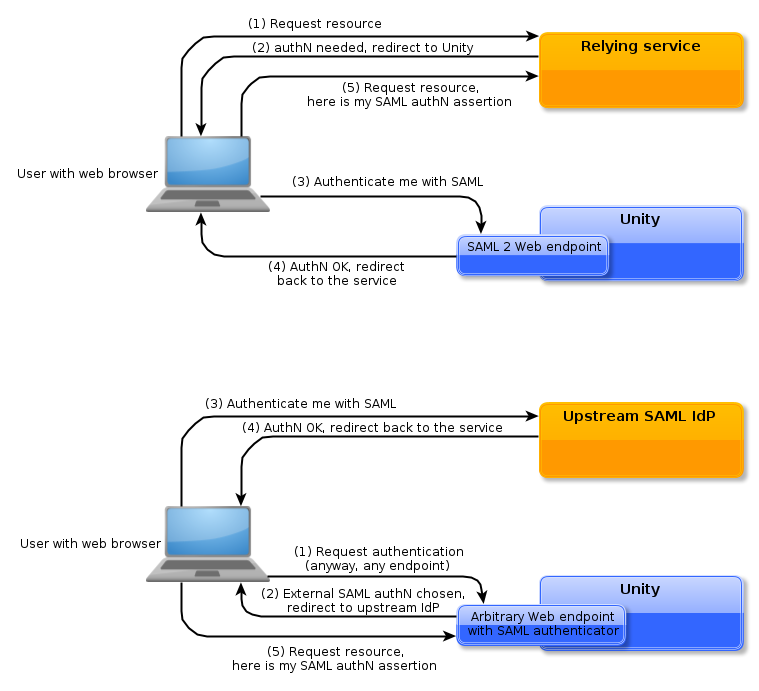 This HowTo provides a step-by-step guide on configuring SAML 2 based authentication in Unity. A basic familiarity with SAML is needed to understand this document. The Wikipedia article on SAML 2 and the official SAML overview provide more then enough of information. By Unity clients to get information from Unity, e.g. a web application may request to authenticate its web browser user in Unity. In this case Unity acts as an Identity Provider (IdP) in the SAML terminology. This functionality is enabled by a SAML endpoint, which must be configured in Unity. By Unity itself to delegate authentication to a 3rd party SAML Identity Provider (IdP). In this case Unity acts as Service Provider in the SAML terminology (from the perspective of the 3rd party IdP). This functionality is enabled by configuring a SAML authenticator in Unity and attaching it to one or more of Unity endpoints. Of course it is possible to deploy both scenarios together, to use Unity as a service which either enrich/transform information about users from upstream IdPs or which provides a common gateway to multiple SAML federations, typically unifying their contents. Unity - you can use another Unity instance (or even the same instance - for testing) both as an IdP or as an SP. Of course any other SAML 2 compliant service should be also able to work with Unity. Discovery Service functionality is not supported in Unity yet. This will be improved in upcoming versions. However Unity comes with a decent Discovery Service functionality embedded, so there is no real need to use external service and therefore we treat this missing functionality with low priority. To enable SAML IdP functionality, one of Unity SAML endpoints must be configured: either the SAML Web endpoint or the SAML SAOP (Web Service) endpoint. The first one is the typical choice, for authentication of Web browser users of Web applications. The latter is used by command line programs, agents or desktop applications, which support SAML directly, without having to use a standard Web browser as intermediary. In the following text the SAML Web endpoint will be configured. There is a couple of SAML specific options that need to be set. SAML issuer (unity.saml.issuerURI) is a unique name of your IdP in SAML domain (often called as a federation). You can choose any URI as a value, but it is suggested to use a URI of your endpoint SAML metadata. Credential (unity.saml.credential) is used to sign SAML assertions and responses (if configured). Typically the credential is the same credential which is used by the Unity HTTPS server, but you can configure a separate one. The credentials are configured in pki.properties file, in SAML endpoint only a name of credential configured there is used. Base group: (unity.saml.defaultGroup and unity.saml.groupMapping. *) SAML, by default does not support group scoped attributes and the majority of SAML consumers won’t understand the Unity concept of an attribute being defined in a particular group. Therefore Unity group must be selected and only the attributes defined in this group will be exposed to the clients. For this purpose a single group can be used or different groups can be configured on a per-SP basis. SP acceptance settings control who is authorized to act as an SP, i.e. to query the endpoint and receive SAML assertions. Typically the SAML endpoint trust is configured using SAML metadata, what is by far the simplest and suggested choice. Unity also allows admins to control the trusted SPs manually, either not to use metadata or to enrich federation metadata with custom SPs. Unity supports several trust models: from fully open to models where each SP needs to be enumerated. Choice of the trust model is controlled with the unity.saml.spAcceptPolicy property. The most popular way to control this trust in the SAML world is to use one type of such enumeration (validRequester): each SP name must be provided along with an URL where responses for this SP should be sent. Note that this is somehow implicit authorization: actually everybody can pretend to be the trusted SP, but the response is always sent to a fixed address of a genuine trusted SP. If a better protection is required, then the strict policy can be used: then all requests must be signed, and the trusted certificates are enumerated in configuration. Reference documentation on all the options can be found in the Unity documentation. There is a couple of additional options for usage of a federation metadata (e.g. how often to refresh the metadata or what truststore should be used during retrieval of metadata). Nevertheless the above example is pretty often enough. To enable the endpoint its unique base path must be established. In the following example the /saml-idp will be used for this purpose. What is more a Unity authentication realm must be chosen (or created), to which the SAML endpoint will belong to. The authentication realm defines general security settings as login session duration. As this is rather advanced topic we will use the default defaultRealm. Finally authentication of the endpoint needs to be defined, by selecting authenticators which should be enabled. We have assumed that the endpoint’s configuration created in the previous step is available in the endpoints/saml-webidp.properties. The endpoint’s name is a simple string used in the UI presented to the users being authenticated. Finally the endpoint will allow for authenticating with a single authenticator pwdWeb1. https://unity-server-public-address/saml-idp/saml2idp-web → URL which should be used by the SAML SPs to redirect the clients for authentication to. To configure the Unity as IdP for a SP typically SAML metadata is needed or a list of parameters, including in the first place the IdP endpoint URL (see above) and its certificate (the one configured in the endpoint’s configuration). Here we provide shortened information on Shibboleth SP and SimpleSAMLPhp settings. Shibboleth SP is configured using SAML metadata. You can configure Unity IdP in several ways: via the Shibboleth Discovery Service (together with many others IdPs), configure automatic Metadata download from Unity’s metadata URL or to download the Unity’s metadata manually and configure Shibboleth to use it. Must be a member of a group configured for a SP. For instance a user who is not a member of the /A group won’t be able to authenticate with SAML when using the example configuration above. Note that this is also true for users authenticating with remote IdP to Unity: then the translation profile must add the remotely authenticated user to the group used by SAML IdP endpoint. Must have a sufficient Unity authorization role, i.e. at least the Regular User role. Users who have no Unity role defined or an Anonymous User role, won’t be able to be authenticated in the most of cases. Must have a Unity identity which is being requested by the client. The most popular transient and persistent identity types are generated on the fly, but in case when a specific identity type is requested (e.g. X500 name) such identity must be defined for the user. The user is able to hide some of the attributes (for privacy reasons) when authenticating with SAML. What is more it is possible to filter attributes on the endpoint level. It is done with ouput translation profiles. See their documentation for details. It is also possible to modify or even create attributes with them. By default Unity endpoint will publish an automatically generated SAML metadata. It is possible to publish a custom metadata document instead (use the unity.saml.metadataSource property). What is more Unity can automatically sign the Metadata, also the custom one (unity.saml.signMetadata=true). Both formats are targeted, i.e. each SP should get different values of identities in such formats, for privacy reasons. Also should not allow for being associated with the actual person. Unity automatically generates and supports both formats. There is one fact to note about the relation of those identities to authentication realms: all endpoints in a single authentication realm will share the targets (i.e. the SPs). That is if we have two SAML endpoints E1 and E2 defined (even of different types: web and soap) in a single authentication realm and a SAML SP A will query the E1 first and then the E2, then the same identity will be returned by both endpoints. Contrary if E2 will be in another realm, then even the persistent identity for the same SP will be different then the one generated by the E1. Translation profile is used to convert and unify the information retrieved from the remote service (SAML IdP in our case) to a Unity representation. The profile should at least establish a Unity identity of the remotely authenticated principal and optionally can assign some attributes or groups. Translation profiles are configured in the Admin UI (Server management→Translation profiles) and are documented here. It can be added automatically (using the mapped information), what is configured in the translation profile itself. It can have a registration form presented to provide additional data about itself. The registration form can be prefilled with the information retrieved from the remote IdP. It can be denied, what is the default behavior. Unity will present a detailed information on what was received from the remote IdP and on all operations performed by the translation profile. as a persistent identifier: it can be directly mapped to Unity identity, preferably it should be of identifier type. as an e-mail, X.500 DN or custom identifier: those can be mapped to Unity identity directly using any of the preferred identity types. Below we present an example of translation profile, that maps uid attribute to unity identity, maps one additional attribute cn as Unity’s cn attribute (i.e. there is no attribute name change) in the / group and finally the mapped user is create if doesn’t exist yet. The SAML authenticator configuration must be provided in a separate properties file. The configuration consists of two parts: common settings and definitions of all enabled SAML IdPs. SAML identity of the requester (unity.saml.requester.requesterEntityId) is a unique name of Unity authenticator acting as SP in SAML domain (often called as a federation). You can choose any URI as a value, but it is suggested to use some URL related to Unity, preferably the URL of SAML metadata of the authenticator. Metadata publication path (unity.saml.requester.metadataPath) is a path under which metadata is published for the authenticator. As in Unity authenticators have no address, there is a special shared pseudo-endpoint available at the fixed location /unitygw where cross-cutting functionality is exposed. The metadata will be published under the path /unitygw/ saml-sp-metadata/NAME, where the NAME must be defined. Displayed name (unity.saml.requester.displayName) is used to distinguish the authenticator from others in the UI. The rest of configuration is a list of the settings of the trusted IdPs. This can be performed in two ways: either a SAML metadata can be set or all the settings can be given manually. The configuration from metadata should be preferred as it is much simpler and allows for automatic updates whenever your federation changes. Manual configuration allows for a greater flexibility. Additionally you can mix both approaches: configure from metadata and override some selected settings with manual entries. In this case the entries are matched by the SAML id of the IdP (so called entity id in SAML slang). To enable it the server must be restarted, or authenticators must be reloaded in the Server management → Authenticators panel of the Admin UI. Configure the metadata settings. Many metadata sources can be configured. URL of metadata is the base option. Local or remote URL can be set. It can be a URL to metadata of a federation or a single IdP. Validation settings can be used to turn on additional signature verification of the metadata. This is useful when metadata is downloaded over the network. Refresh interval can be used to control how often the metadata should be reloaded. Unity specific settings translation profile and optionally the registration form for unknown users are never provided in SAML metadata. If a common registration form/translation profile is valid for all IdPs from the metadata then it should be also set. Otherwise at least the translation profile should be set manually per each trusted IdP. Displayed name of a SP (unity.saml.requester.remoteIdp.X.name) is used in the authentication UI. Certificate of the IdP (unity.saml.requester.remoteIdp.X.certificate) is used to verify the signature of the response. Only the name is configured, the actual certificate must be defined in the pki.properties file. Requested identity format (unity.saml.requester.remoteIdp.X.requestedNameFormat) if the format which should be requested for the IdP. It is especially important when SAML identity is mapped to Unity identity directly. Translation profile (unity.saml.requester.remoteIdp.X.translationProfile), which is used to translate received information to Unity’s representation, as described in the preceding section. The detailed reference of all possible options is given in the Unity documentation. The same authenticator can be added to several endpoints. To apply the authenticators change, the server must be restarted, or the changed endpoint must be reloaded in the Server management → Endpoints panel of the Admin UI. This part is highly IdP specific. Some of the IdPs require to have the SAML metadata of the Unity SP provided. Other will require to provide its SAML name and response return URL, which is https://unity.example.com/unitygw/spSAMLResponseConsumer (for all SAML authenticators). As an example configuration of Shibboleth IdP and SimpleSAMLPhp is presented below. Shibboleth IdP is configured using SAML metadata. You can authorize Unity SP by configuring automatic Metadata download from Unity’s metadata URL or by downloading the Unity’s metadata manually and configuring Shibboleth to use it. in the <metadata:MetadataProvider id="ShibbolethMetadata" xsi:type="metadata:ChainingMetadataProvider"> element. Of course IdP functionality must be enabled in SimpleSAMLPhp. Log out all SAML session participants supporting SLO, regardless whether they are SPs or upstream IdPs, using any of the SOAP, HTTP Redirect and HTTP POST bindings. Initiate the logout process by receiving a logout request for the SP address (i.e. for Unity’s remote SAML authenticator), IdP address and directly by logging out in any of the Unity’s own UI. When logging out session participants with asynchronous bindings (i.e. with web browser redirects) it may happen that one peer is misbehaving, what will break the logout process, probably leaving user’s browser in a strange state. Many SAML implementations either do not support SLO fully (if at all) - Shibboleth IdP being a notable example - or their installations are not configured to support SLO. Unity is not presenting an information whether the logout process was performed partially or fully. As a rule of thumb it can be assumed that logout was partial only. Therefore the feature should be considered as the best effort only. Some SAML implementations implement logout over SOAP in simplified way, so that the SOAP logout is not fully functional. Unity fully supports SOAP logout, and from Unity perspective this is by far the safest bet, however sadly not fully interoperable with 3rd party implementations. It can take three values: internalOnly, internalAndSyncPeers and internalAndAsyncPeers. The first one turns off logout of external peers. That is, remote peers still can request logout from Unity, but Unity won’t propagate it to further session participants. The second one performs a safe, synchronous logout of those session peers which support SOAP logout binding. The final one offers the largest interoperability at the same time being the most risky as during the logout the user’s browser can be even multiple times redirected to other session participants, with assumption that those participants will redirect the browser back. To configure Single Logout and to discover all the settings of Unity SLO endpoints the easiest method is to use SAML metadata. Unity’s metadata of both IdP and SP provide all necessary information. The manual configuration of trusted peers addresses is also possible, see the reference documentation table of respective SAML configuration file. Those settings define the key part of all the SLO endpoints for the authenticator (to distinguish them from SLO endpoints of other possible authenticators configured) and binds the authenticator to a concrete realm. This last settings is necessary as logout is destroying a session which is realm scoped.